I always tell people to expect neither flattery nor realism from my portraits of them. Fortunately, these fellow sketchers are not easily fazed. My urban sketching meetup group met in West Vancouver this long weekend. Officially, there are now 277 members in the group, but that day it felt more like 4. Probably because only 4 of us showed up. There is a core group of about a dozen regulars. Don and I talked about whether this was disappointing, but I decided it’s not. One can not expect more. 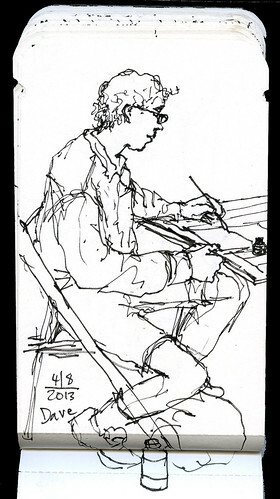 Even in Berlin the number of regular sketchers wasn’t any bigger, and one woman, Katrin, who became my good friend, is still setting up most of the sessions there. 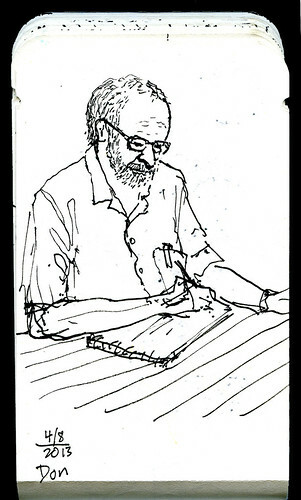 The people who regularly come to our meetup group already have a sketching practice. They are independently motivated and don’t really need a group to help them get out and sketch. But the connection with others who have the same passion makes the meetup group worthwhile. It’s not about the number of converts. Sketching with a couple of people here and there, instead of always alone, is all I’ve been hoping for. 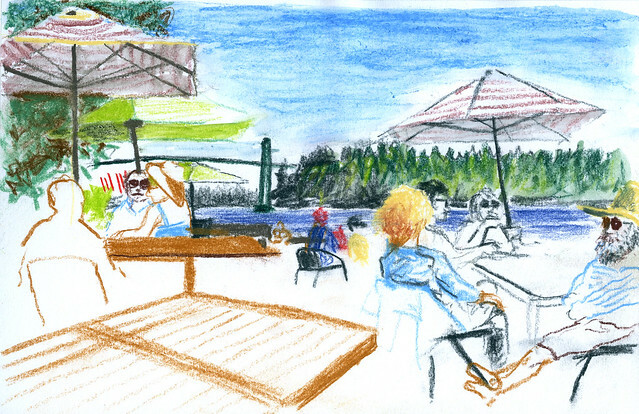 So Dave, Don, Sarita and I sat comfortably at an outdoor table with cool drinks, while sketching, talking, and listening to live music at the West Vancouver Harmony Arts Festival. To get there, I rode my bike across the Lions Gate Bridge for the first time ever, which was strangely exhilarating, as though I was exploring unknown territory. Once in West Vancouver, I even rode through a dog-walking-only zone, which is a misnomer and should say “designated poodle-walking lane”. Dave had warned me of the wrath of the poodle-matrons. Sure enough, after about 17.5 meters, I was told to get off my bike by a white-haired woman with a large brown poodle. Somehow, it was exactly what I needed at that moment. After the meetup ended, I made my way to Third Beach. 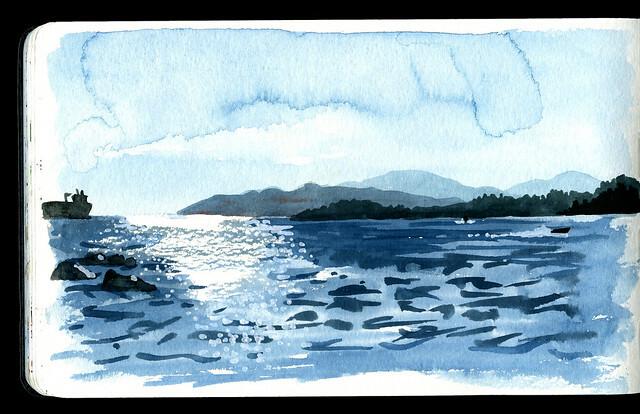 On the way there, I sketched the Lions Gate Bridge and then sat down on the seawall and tried to capture the end of a summer day with the sun coming down low over the water and the light flattening out the islands and mountains. I can’t imagine a more beautiful place. Finally at Third Beach, a twitchy, chatty, slightly aggressive man started watching me draw and after a while (I had seen it coming) began talking to me in an impatient tone. Detecting my accent, he started asking me a lot of questions about Germany. He was not happy with my answers at first, then luckily he got so impatient that he started answering his own questions so I could just nod and smile calmly once in a while. I felt it was best not to aggravate him. He seemed high on something. And I always love it when people, upon figuring out that I am originally from Germany, use the word “Hitler” in their very next sentence. As a hairdresser once did: “You’re from Germany? People always tell me I have Hitler eyes!” That hairdresser did have intense blue eyes. But I didn’t go back for a second visit. Having conquered the Lions Gate Bridge by bike, it felt appropriate to draw it afterwards, almost like capturing some sort of game trophy. And I am also collecting vertical motifs for possible conversion to etchings later, for the poetry book I am collaborating on. As I was drawing this, I was thinking of how skeletal structures are evident in this bridge; it looks like a spine. Maybe this anthropomorphic quality is what makes bridges so exciting to me. Back to Third Beach. I managed to stretch my sketching day into the sunset. Third Beach was remarkably empty for the August long weekend Sunday. I think people are taking the perfect weather for granted and not coming here in droves anymore. Twitchy-chatty guy commented: “Hah! You’re perving on these people!” But “these people” were appreciative, not weirded out when I showed them the sketch that they happen to be in, and both took a photo of it.